Ronald Wright reads from What Is America? : A Short History of the New World Order. Part of the Vancouver International Writers and Readers Festival 2008.
about our neighbour and ourselves. provided by Duthie Books Fourth Avenue. Ronald Wright reads from What Is America?, A Short History of Progress. 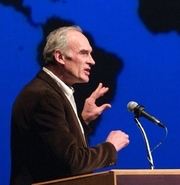 Ronald Wright is currently considered a "single author." If one or more works are by a distinct, homonymous authors, go ahead and split the author. Ronald Wright is composed of 2 names. You can examine and separate out names.